Robotic rovers sent to explore the Moon will face a major hazard in the form of electrostatically elevated dust, according to a report being presented today at the National Astronomy Meeting (NAM) by Professor Farideh Honary of the University of Lancaster. An astronaut's boot print in the lunar dust, or regolith. Image: NASA. Rovers have been exploring Mars since NASA's little Sojourner rover in 1997 and have occasionally struggled in dust - Spirit and Opportunity's solar panels became covered in Martian dust, for example. On the Moon, however, dust is a far greater threat. Apollo astronauts reported dust clinging to everything and its abrasive nature could be harsh on a rover's electronics and machinery. The situation becomes worse, says Honary, at the lunar terminator between day and night, where a potential difference builds up, creating an electric field that can charge dust particles and levitate them. Honary, working with the ONERA, the French Aerospace Lab, simulated a rover on two patches of the Moon, one in full daylight and the other at the terminator. Dust was then added to the simulation and in both cases dust would rise up above the rover. However, in full daylight the dust would move away from the rover, while at sunset or sunrise the dust moves inward towards the rover before accumulating directly above it. This would potentially lead to a rover gathering large amounts of dust on top of it. Given the slow length of the lunar day - 14 days of daylight followed by 14 days of night, sunset and sunrise can last quite a bit longer than they do on Earth. 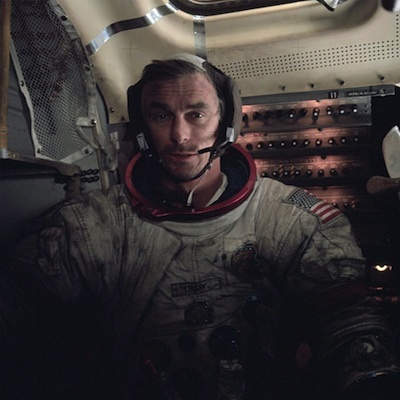 Astronaut Gene Cernan pictured inside the lunar module of Apollo 17 following a spacewalk on the Moon. Image: NASA. "Both the Moon and Mars have dust but the difference is their atmosphere," Honary tells Astronomy Now. "The atmosphere on Mars has a mitigation effect since charged dust particles can lose their charge to the neutral molecules that make Mars' atmosphere." In addition, Mars' gravity is greater than the Moon's, which can affect how high the dust levitates. Although more tests need to be conducted to determine exactly how much dust would gather on a lunar rover and what would be considered a safe amount, one possible solution she says is to build a dome shaped rover so the dust simply falls to the ground rather than gathering on flat surfaces. Consequently, perhaps lunar rovers will end up looking more like R2-D2 than Short Circuit in the future.